Founded in 1824 by brothers George and Henry Elkington, Elkington & Co. is one of the most world-renowned manufacturers of English silverware. In 1838 the brothers found success when they patented and cultivated an electroplating technique which involved coating a thin layer of metal onto the surface of a workpiece by using an electric current. This process would catapult Elkington & Co. to worldwide recognition. Altering how silverware is crafted, by 1860 Elkington & Co. had grown exponentially, becoming the world’s leading maker of silverware. The exceptional quality of their silver gained the notice of many, leading to countless commissions and awards. The most notable commission was from Queen Victoria. Elkington & Co. silverware was seen in a variety of places, from the ladies single trophy at Wimbledon to the dining wares on the Titanic. 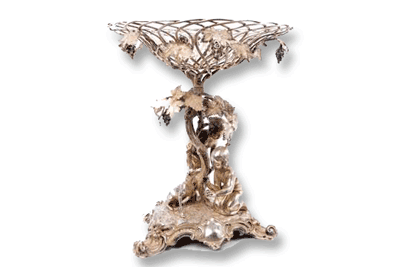 As the 19th century progressed, Elkington & Co. continued to exhibit their silverware, receiving the highest of accolades for their extraordinary expertise, artistic skills, and technological advancements. Elkington & Co. were honoured with the Gold Medal of excellence at the Great Exhibition in Crystal Palace, Hyde Park where their exceptional artistry and innovative skill were celebrated. In 1843 Prince Albert became a patron and collector, a tradition which continues today. One can see the vast collection at the Victoria and Albert Museum which houses the world’s largest collection of Elkington & Co. silverwares in the Silver Galleries. Elkington & Co. were influenced by a range of styles and designers. For example, upon seeing a display of Japanese art at the 1862 Paris exhibition, Elkington & Co. cultivated a range of enamelled wares influenced by the Japanese designers and exhibited them at the Paris exhibition in 1867, as well as the Philadelphia Centennial Exhibition in 1876. Some of the most notable designers at Elkington & Co. were Auguste-Adolphe Willims, Léonard Morel-Ladeuil and Christopher Dresser. Auguste-Adolphe Willms was a French designer who worked who joined Elkington & Co. and had a prosperous relationship with them until his death. He was greatly inspired by medieval European, Islamic, and Japanese art. 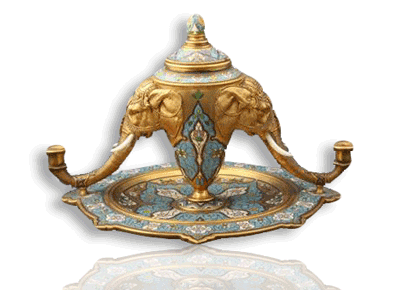 Some of his most notable designs were of perfume burners, vases and plates. Léonard Morel-Ladeuil was a French designer who remained with Elkington for over 20 years. One his most prominent works were of “Milton Shield: Paradise Lost”, a masterpiece in repousse steel and silver which stole the show at the Paris Exhibition. Christopher Dresser, another designer in the 19th century, was heavily influenced by both Japanese and abstract art. Known as “the father of industrial design”, his designs at Elkington and Co. reflect his love of the botanical world. His works were analytical, scientific and full of absolute precision. In his illustrious career for Elkington & Co., he supplied designs for silver, ceramics, plates, glass and textiles. The tremendous influence of Elkington & Co. can be found all over the world. 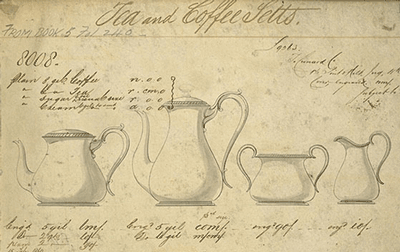 From silver and electroplating to home tableware to fine art, their innovative experiments allowed them to improve their techniques resulting in glorious wares. The success of Elkington and Co. is a tribute to the extraordinary quality of their products. If you would like a free, no obligation valuation of your Elkington silver please use the form below.